Manchester has a certain Northern charm that lures 105,000 (or so) students to study at its four main universities and reputable education institutions. It is a cosmopolitan hub of economic growth, great music old and new, vibrant culture and rich history. With courses ranging from Fashion: Image Making and Styling at Salford University, to professional body accountancy ACCA qualifications at LSBF Manchester, you will find your preferred subject in the capital of the North. As Manchester is the fastest growing British economy outside of London, with a GDP of £28b, it’s clear that a business qualification such as an MBA will get you far if you want to stick around after graduation. Beyond choosing the perfect course, students want to know all about the nightlife, prices and shopping in the university’s area. So, let’s have a quick run through. In 2001, New York Times named Manchester one of the top 20 must see places in the world, describing it as ‘an industrial city reinventing its famed music past’. 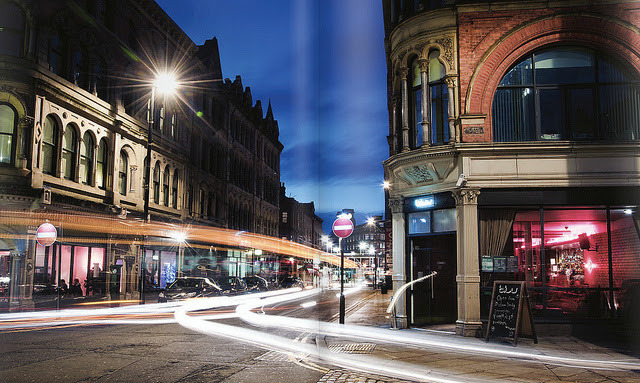 With popular areas like the trendy Northern Quarter and fun-time Deansgate, along with live gigs found all other the city, there’s always somewhere cool to go at night. The cost of living is extremely affordable compared to London, but then again, most places north of the capital are! Student accommodation is widely available throughout the city, and you can rent a place from as little as £85 a week. Transport is also reasonably priced, with great tram, train and bus systems. Whether you want to spend a day at the Trafford Centre, hit the vintage boutiques or splurge in Harvey Nicolls, Manchester is a pretty stylish place with plenty of opportunity to spend your loan. On graduating you might find it hard to move away from the city, so you want to know that there are plentiful opportunities, right? Experian’s Inner City Vibrancy Report 2103 named Manchester as the most vibrant place to live in the country. It showed that the number of young professionals living in the city has increased since 2001 but unemployment has decreased at the same rate. According to the Annual Business Inquiry in 2010, Manchester’s biggest sector is financial and professional services, accounting for a sixth of employment. This is good news for anyone studying the professions in this sector as you can feel confident about getting a good job after graduation. With its education establishments climbing up the Guardian University League Table over the years, Manchester is such a brilliant choice for both a top degree and buzzing social life. Image by Duncan Hull, used under the Creative Commons license.